I’m on a real estate kick right now and have been delving into a lot of the details surrounding rental real estate investment. For those just tuning in, My wife Mrs. C. and I purchased our first rental property in December and are planning an aggressive ramp up. 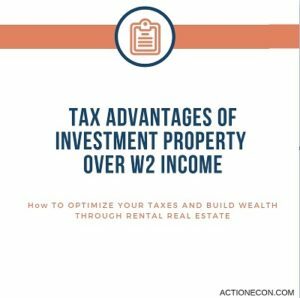 There are many significant tax advantages of investment property over W2 income. Rental Income is better than W2 income because the tax treatment of rental investment property income is extremely beneficial and rather than trading your hours for money you are mostly using capital to earn money. Our long term goal is to replace all of our income with rental income, starting with Mrs. C.’s income from her job. She will then be the primary property manager for our rentals. No Social Security Taxes: This is the big tax advantage of investment property right here. With our contributions to retirement accounts and having 4 kids we have a negative federal tax bill and a low state income tax bill, although our marginal rate is still 15% on the federal level and 4.25% on the state level. The vast majority of our taxes are Social Security taxes. For W2 income Social Security and Medicare taxes are 7.65% of income. For rental properties you do not have to pay this tax because it is not seen as earned income. There are exceptions to this such as if you are providing a large amount of services to your tenants, such as running a bed and breakfast. For a family earning $70,000 a year these payroll taxes account for $5,355 a year! Fully Deductible Expenses: You don’t have to itemize your deductions or hit a certain threshold to deduct your expenses involved in rental real estate. Any repairs and maintenance, property taxes, insurance, and mileage directly related to your rental properties can be deducted. You can’t deduct your mileage to and from work everyday. By taking the federal mileage rate you can also end up ahead if you drive an inexpensive vehicle. My $1,200 car that gets 30 MPG gets the same federal deduction of 58 cents a mile that a $40,000 truck getting 15 MPG gets. When deducting this stuff it is important to keep detailed and accurate records in case the IRS ever wants to investigate. The IRS has also made it easier to deduct expenses in the current year rather than as a capital expense over several years through the de minimis safe harbor election. Previously this had been set at $500 and is now $2,500. By electing to use the de minimis safe harbor election expenses up to $2,500 per invoice item can be deducted in the current year. This allows the owner to have more deductions now and greatly simplifies accounting. Depreciation: The IRS allows us to depreciate the cost of our buildings and capital improvements over a 27.5 year schedule. Your receive the cash from your rent, but this “phantom expense” gets deducted from your taxes. If/when you go to sell the home the IRS does a depreciation recapture and charges taxes on all depreciation claimed at your tax rate. For example, if I purchase a home that cost $40,000 and the township says the land is worth $4,000 and the building is worth $36,000 then my basis is $36,000. If I depreciate this over 27.5 years that is a $1,309 deduction every year from taxable income. Although the IRS charges that depreciation recapture amount if the house is sold, you don’t have to ever sell the house. 1031 Exchanges: One of the best tax advantages of investment property is that you do not have to pay taxes on rental property sales ever. If you want out of a property or even a set of properties, you can sell them and buy a different property and defer the capital gains and depreciation recapture until that new property sells. You have to identify the new property within 45 days of a sale and have 180 days to close on the new property. The new property has to be equal or greater than the old properties in total cost and you can not take any cash out of the deal. Many investors never pay capital gains tax on their properties through this method and pass the properties on to their heirs. Check out the book Exchanging Up for a detailed guide on how to properly use 1031 exchanges to build your real estate empire. Guess what? when someone inherits real estate their new basis is the current fair market value of the home, and since the estate tax is set with a $11.18 million exemption you pay no death tax either. The property passes tax free to your heirs. No capital gains, no depreciation recapture, and no estate tax. Long Term Appreciation: A property generally increases in value over time (despite the IRS giving us a decent depreciation deduction). This is a form of deferred capital gains, just like paper investments in an IRA or 401K. When you sell the home in the future, if you ever sell it, taxes will be set at the long term capital gains rate, rather than ordinary income. As mentioned above you can roll the gain into a 1031 exchange and pay no taxes. If you must sell the property and cash out you would be paying long term capital gains which have the following tax brackets: 0% for taxable income if in the 12% tax bracket ($78,750 for a married couple), 15% for taxable income up to $488,850 for a married couple, and anything above that 20%. This is WAY lower than earned income tax brackets. Hours To Manage Property Vs. Work Hours: I don’t have anywhere near enough experience to give a baseline for total number of hours per month a landlord spends on each property. From doing a bit of research online I have found that 4 hours per month seems to be about average. With proper systems in place such as online rent payment, tenants responsible for lawn care / snow removal, and accounting software can lower this substantially. One property manager with 5 houses wrote that he spends about 5 minutes a month on his rental properties that all have long term tenants verifying that the automatic rent payments went through. I’d love to hear from any landlords reading this how much time they spend on their rental properties per month. There’s also the option to pay roughly 10% of gross rental income to a property manager to further reduce total time managing the property. QBI Deduction: This potential tax advantage of investment property is really interesting. There is still a ton of uncertainty over whether or not Schedule E rental properties will count as qualified business income for this tax deduction. There are many tax professionals arguing both ways on this. This deduction is worth 20% of your total business income. For example if your taxable income from a property was $10,000 the QBI would give you a deduction of $2,000. If your taxable income from rental property was $70,000 the QBI would give you a deduction of $14,000. The point of the QBI deduction was to level the playing field with C corps by effectively giving sole proprietorship and other business formats similar tax treatment. We happen to already be in a low tax bracket, but the QBI doesn’t care what personal tax bracket you are in. Offsetting W2 Income: This is extremely important for high income individuals, especially those with a stay at home spouse. Typically you can only deduct passive losses against passive gains, and any excess loss is carried forward until you do have a passive gain. For example If I have real estate losses of $10,000 from my rental activities this year, I can not deduct them against my W2 income, I have to wait until I have real estate gains in a future year to offset this loss. The IRS however allows “Real Estate Professionals” to deduct their passive losses against W2 income in the current year with no limitation. To become a real estate professional you must spend over 750 hours on your real estate business, materially participate in it, and have over half of their yearly personal services be in the real estate business. If a non working spouse of a high earner can become a real estate professional then it makes sense to invest in real estate that on paper loses money every year, yet still provides significant positive cash flow. Remember how we talked about depreciation being a phantom expense earlier? You simply use this to your advantage in high dollar markets. A single family home in a high cost area that costs $600,000 and rents for $4,500 a month. The property is generating $11,000 a year in cash AND offsetting $10,818 of taxable income from a high tax bracket. If you are a high earner in a high tax state with a 50% marginal rate this is like getting another $5,400 in cash a year. I know these numbers aren’t entirely realistic, but it serves the purpose of this demonstration. Now imagine scaling this to 8 properties, you need to scale to several properties quickly to meet the IRS threshold of 750 hours. That’s $88,000 in cash in pocket income AND a reduction in taxable income of $86,554. This is especially useful for properties that you expect to gain in value that can later be 1031 exchanged into new properties with no capital gains or depreciation recapture tax due. The spouse of the high earner who manages these investments is bringing in $88,000 a year in cash and cutting the tax bill by $43,000 a year for an effective total income of $131,000. As an added bonus since this strategy greatly reduces AGI, it becomes easier to qualify for other tax credits and deductions that have phase outs as well as for Obamacare subsidy calculations. This particular situation doesn’t apply to us but is extremely helpful for many people. We are not a high earner household and our real estate investments are on the opposite end of the real estate spectrum, like the $19,000 rental house we recently purchased. It is extremely important to be 100% accurate that you count as a real estate professional or the tax loss deduction goes away. Currently Mrs. C and I combined work around 2,500 hours a year, which is pretty darn low since a full time employee works 2,000 hours a year. Mrs. C. works about 1,100 hours a year and earns around $11 an hour. She would earn much more per hour if she were able to work full time, but with me needing to travel for work and having 4 kids it isn’t remotely feasible for her to work a full time job. Mrs. C.’s job gives her extremely flexible hours and has been instrumental in keeping us solvent when I’m off work and with putting more money into retirement accounts. Anyways she earns about $12,000 a year while working 44% of the total hours we work as a couple. With the better tax treatment of rental properties if we had rentals generating around $10,000 in income we would be able to have her quit her job and still be able to save the same amount of money per year. This is a no brainer. With our first rental property the total income from it is roughly half of what we need so in theory one more property will put us in the strike zone, although I would feel more comfortable waiting until we had 3 total. In the above example I assumed all properties are 100% financed which is why the mortgage interest expense is so high. Although our first couple properties will be financed, we plan on paying cash for properties starting in 2021 once our primary residence is paid off. There is another speed bump here as well. Currently we are buying property with our HELOC to be able to make cash offers. We need to refinance the properties into a 30 year fixed loan to get the payment down because our HELOC requires a massive principal repayment every month (5% interest rate but the minimum payment is 1.5% of the total balance). On $50,000 of real estate our HELOC has a $750 a month payment, whereas a 30 year mortgage would have roughly a $270 a month payment. Tying up almost $500 a month in extra principal repayment makes this not work for full income replacement. The net investment tax is charged for single filers with an AGI of over $200,000 and married filing jointly filers with an AGI of over $250,000. This tax is 3.8% and levied on passive investment income as well as on capital gains. This is something that might not apply to your average real estate investor, but if you have a high income job already and/or sell a property for a large gain without using the 1031 exchange this tax is likely to be applicable. The taxpayer owes tax on the lesser amount of the amount over the threshold OR the total of net investment income. John C. and Mrs. C. have active income of $100,000 and real estate rental income of $180,000. Their AGI is $280,000. $30,000 is the less of either total investment income or amount over the tax threshold. $30,000 X 3.8% = $1,140 in tax. Overall the net investment tax is a mosquito compared to the whale of total preferential tax treatment given to real estate investing. 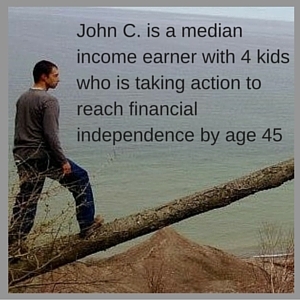 John C. and Mrs. C. have total passive income of $600,000 and no active income. Tax would be owed on $350,000. $350,000 X 3.8% = $13,300. I actually did worry about this a bit because Mrs. C.’s earnings have always been relatively low. If she stops working all together before she is 40 she certainly won’t have 35 years of earnings to average out and for the years she does have her earnings aren’t high. Her lifetime Social Security income will not fill up the bottom Social Security bend point, which gives a 90% credit on your average indexed monthly earnings. Social Security takes your highest 35 years of earnings, indexes them for inflation, then divides by 420 months to see what your average monthly earnings are after indexing for inflation. This number is then put through a series of 2 bend points. Before the first one multiplies by 90%, after the first one by 32% and after the second one by 15%. This will give you what the Social Security administration calls your Primary Insurance Amount and is the amount you would receive if you took Social Security at full retirement age. This amount is reduced if you take it early and increased if you take it late. Currently the Social Security bend points are $926 and $5,538. Mrs. C. worked part time and retired early. Her total Indexed earnings amounts to $200,000. $200,000 divided by 420 months is $476 per month (her AIME, Average Indexed Monthly Earnings). Multiplied by .90 gives a PIA of $428. Dave worked til he was 60 and earned $1.5 million over his top 35 years of working for an AIME of $3,571. His PIA is $926X.9 + ($3,571 – $926)*.32. = $833 + $846 = $1,679 PIA. Ok, so this tells us that the best bang for your buck is to hit $926 in average indexed earnings, which is $388,920 in lifetime earnings. For Mrs. C. to hit this and get a monthly PIA of $833 she would need to double her lifetime earnings. So then the question becomes does it make sense to work another 15 years to hit that number? $400 a month is the equivalent of $96,000 of invested assets in a retirement account with a 5% withdrawal rate, OR the equivalent of the cash flow from 1 2 bedroom house rented out that cost $25,000 with a mortgage. In our situation working more to fill up even the most generous Social Security bracket doesn’t make sense. But Wait! There’s more! In less than a year Mrs. C. and I will have been married for 10 years, so even if we divorce at some point she is entitled to file a claim off my Social Security record. In the best case scenario (super early retirement) my lifetime earnings will be around $1,000,000, Giving me a PIA of $1,298. She has the option to take half my amount, which is $649. It is absolutely NOT worth the $184 per month difference in benefits for her to work another 15 years to fill her AIME up to the 90% bend point. One option to increase her Social Security earnings is for her to become a real estate agent after quitting her current W2 job. Being a real estate agent would allow for us to be able to view properties we are interested in easier, without having to schedule with a 3rd party real estate agent. She would then earn the buyers agent commission on our purchase. It would also be easier to throw out a lot of low ball offers on properties that have been on the market for a long time, as many real estate agents don’t want to spend their time on this strategy. She could also occasionally work as a buyers agent for people to earn some more commissions, which would require a 15.2% Social Security tax. This comes up a lot where people are concerned that vacancies will greatly reduce rental income. We are planning to focus on Section 8 rentals which have an extremely low vacancy rate and tenants tend to stay longer than average. Mrs. C. works in auto parts retail and her hours are subject to seasonal fluctuations that are comparable to rental vacancies. For example, in January, in Michigan auto parts sales are down quite a bit and her hours are down 40% from the fall. We also plan on focusing on larger 4 bedroom and 5 bedroom homes, which you rarely find for rent in our market. What do you think about W2 income vs. Schedule E rental income? I am convinced it is certainly the right move for our family to reduce and eventually eliminate my spouse’s low paying job. As we scale it can potentially do the same for my job as well. For a great guide on real estate tax strategies check out The Book on Tax Strategies for the Savvy Real Estate Investor: Powerful techniques anyone can use to deduct more, invest smarter, and pay far less to the IRS!